Today's weather made me feel like it's fall again. As much as I like fur, leopard print and burgundy, I think I've had enough of those trends for this year. So, I decided to break out of this mood and look at some colorful details as an inspiration for tomorrows outfit post. Here are my favorite pics! Colorful, fashionable, simple but at the same time effective pieces and ways to combine them. All the pics are from my tumblr, don't forget to follow! You can also follow Maya's Fashion Corner on facebook! Great photos! Love those neon heels..
i jut love the colors! OMG, so colorful!^^ JUST SUITS FOR SUMMER! Beautiful pictures, very inspiring post! Your blog inspires me to use alot of bright colours! Cheerful! Let me know if you'd like to follow each other! I appreciate it! I really like this! Your photo makes me very happy! 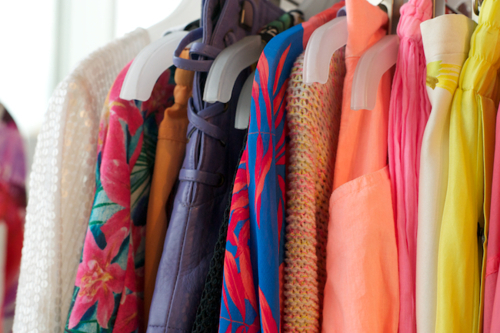 Spring and Summer is all about colours, colours and more colours! Nice blog.Can we follow each other? P.S. Majo, imas mail od mene ;) baci pogled! So cute! I love all the bright colors- and today's 90 degree weather makes them just perfect :) Thanks for stopping by my blog today! Amazing colors!The neon sandal is just gourgeous, love it! Thanks so much for the lovely comment on my blog dear, im following you! Uplifting colors :) Love the peach colored denim, and the chartreuse blouse is beautiful! Thanks for the comment and visiting my blog, doll! 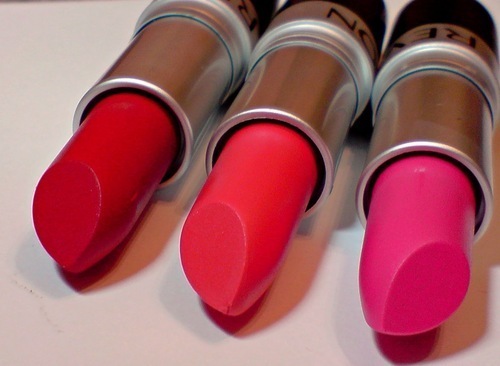 Love this color post, very happy and fun! Love your style -- I'm also OBSESSED with colors right now. I have to stop myself from overloading on colors sometimes. Savrsen izbor fotki! ne znam koja mi je bolja od koje! hiya, love the shoes in the first pic and the statement necklace.. thank you for the lovely comment. i always love discovering new blogs and getting inspired!! now following via GFC. me ha encantoado tu log!! Ya tienes una seguidora mas!! Thank you for coming on my post. Your blog is lovely! This colors are beautiful!!! Thanks for sharing! tomorrow we continue wiz some more fashion show, but now for the boyfriend. :) take a look! kisses! Beautiful colors! Maybe we can follow each ohter? I love colors in my wardrobe too, we need fun in our lives :). So beautiful inspiration!!! 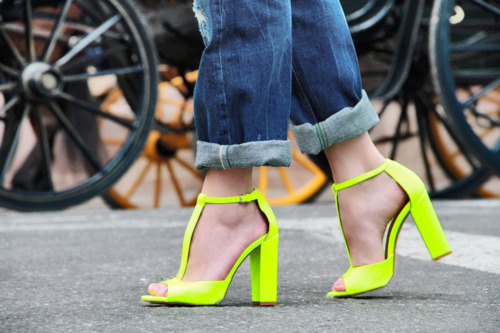 I can´t wait for my new neon heels to arrive!! Wow,love all those colors! Thanks a bunch for stopping by and commenting! You have great style and a wonderful blog and I'm your new follower! Great inspiration! 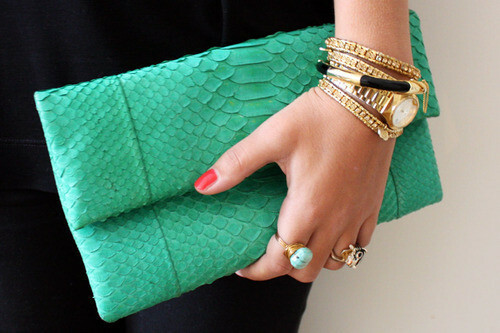 I have that clutch in black color but this green color is amazing. Love it! AMAZING choices and pics!!!!!! love them!!!! you have e new followe r now and if you wish come andd see my virtual space too :) kisses from Italy!!! Is that your own clothes? COOOL!! follow each other?